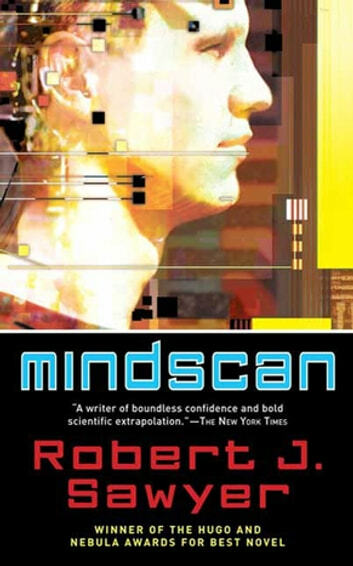 Hugo Award-winning author Robert J. Sawyer is back with Mindscan, a pulse-pounding, mind-expanding standalone novel, rich with his signature philosophical and ethical speculations, all grounded in cutting-edge science. But suddenly Karen's son sues her, claiming that by uploading into an immortal body, she has done him out of his inheritance. Even worse, the original version of Jake, consigned to die on the far side of the moon, has taken hostages there, demanding the return of his rights of personhood. In the courtroom and on the lunar surface, the future of uploaded humanity hangs in the balance. Mindscan is vintage Sawyer -- a feast for the mind and the heart. An action-packed thought experiment on what it would be like for a human brain to uploaded into a machine. Sawyer describes this process in great detail, you almost feel what it's like for a mind to occupy a machine body. Not to mention the philosophical and ethical implications this idea poses... Couldn't put this one down! Really enjoyed this story of transferred/uploaded human consciousness, as told by both the original biological person, as well as the uploaded successor. Really interesting, but not pedantic, exploration of the bioethics and philosophy of consciousness and the soul.